iRemocon is a sophisticated network-connected learning remote control. iRemocon is a sophisticated network-connected learning remote control that coordinates with communications devices such as smartphones. 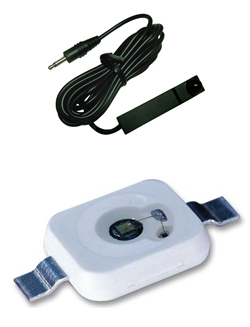 It is capable of controlling various kinds of home appliances remotely. 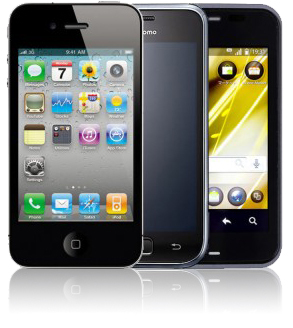 Your smartphone is a remote control for home appliances at home, as well as outside the home. You don’t need a separate remote control. Supported on iPhone, iPad Air, iPad, iPad mini, iPod touch, and Android. ※ Please refer to Compatible devices for supported version. ※ We recommend you set the automatic Wi-Fi sleep mode to “off” on Android handsets in order to use iRemocon comfortably. With the “UI designer” on our website, you can fully customize the interface of your remote control by downloading your favorite wallpapers and images. Only drag and drop the parts you want to use. Anyone can easily design an original remote control. Why not get a remote control of your very own? 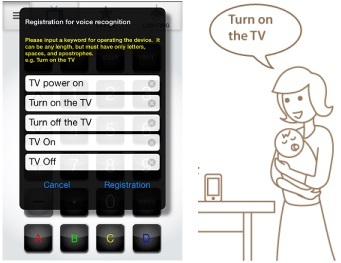 ※ The images below are default pre-installed remote control interfaces. Since there are several remote control designs installed in advance, you can just select one and start using it right away. ・Turn on the air conditioner and make sure the room is at a comfortable temperature before you come back home. ・Turn the lights on when you’re held up unexpectedly to deter crime. ・Monitor and interact with your pets while you are away. 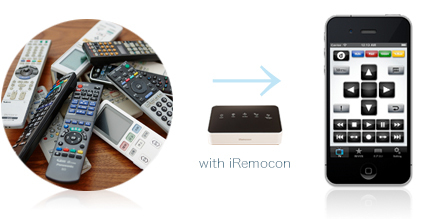 iRemocon is capable of controlling home electronics at home, as well as outside the home. The settings are easy; just connect iRemocon to your router with a LAN cable. You don’t need specialized knowledge such as router settings. ※ Please do not use iRemocon to control appliances that may be involved with medical equipment, could represent a risk to human life or property, or which are required for safety. ※ Operation outside the home feature is a Paid service. Please subscribe to a premium membership. Using the voice operation enables you to control the registered home appliances by voice. Talk to your phone to control devices even when your hands are full. iRemocon detects your location with the iRemocon app installed on your smartphone, and controls your home electronics automatically when you come home or leave. ※ GPS linked feature is a Paid service. Please subscribe to a premium membership. We are very thorough regarding the basic features of a learning remote control, “LED learning” and “LED transmission.” The broadband infrared ray (IR) leaning sensor and the unique learning logic makes it possible to learn various kinds of remote control LED codes. Furthermore, the infrared LEDs that transmit remote control signals use wide-angle and high output LEDs, even with a standard iRemocon, so you can control home appliances that are placed in a wide variety of locations in your home. If the LEDs cannot reach all of your appliances, additional infrared LED cables are available as an option. With up to two additional infrared LED cables, you can control home electronics that are placed in even the oddest corner of your rooms. ※ Please be sure to use genuine iRemocon external infrared LED cables. The infrared LED is different inside, even though others may look the same as the genuine item. If you use other types of infrared LEDs, rather than genuine ones, this could cause breakdowns or serious accidents, and we cannot be responsible. ※ We are planning to release the infrared LED cables in the future. ・When you wake up, run the air conditioner and play music just by pressing a button. ・Set your alarm, and have it turn on the light when you wake up. ・If you want to watch a film, dim the lights, roll down the screen and start the film automatically with one button. ・When you go to bed, all the lights are switched off with just one button. Your life is so comfortable with iRemocon! ※Please do not use iRemocon to control appliances that may be involved with human life or property! ・Turning on the lights to deter crime while away for extended periods. 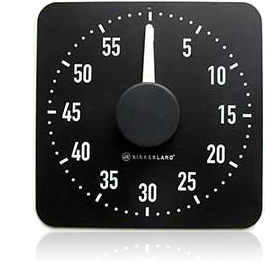 ・Turning the TV on to a specific channel at a specific time to catch your favorite TV show. ・Turning off the air conditioner to save energy when you won’t be back at the expected time. iRemocon automatically transmits remote control signals at a programmed time in the future. 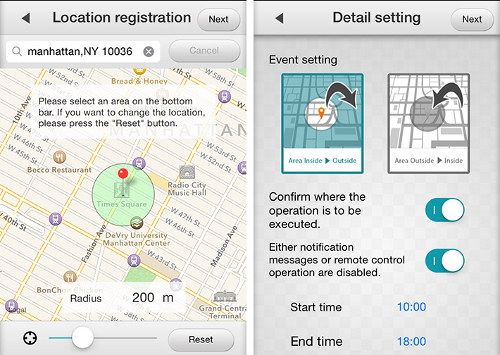 ● Click here for more information about iRemocon Voice Recognition and GPS linked features. Control home electronics at home and outside the home with your iPhone!